Although diminutive in stature, Kev volunteered for the demanding post of wicket-keeper a few years back. This quality and the fact he is rather fit probably helped bucket-loads when it came to flinging himself around in the general direction of the ball. Mind you, he had been known to have the occasional bad spell - or even game - where he missed more than usual, but not without some style. You've got to be fair here though, if the bowler(s) didn't have a clue where they were bowling at, what chance did the batsman, let alone the wicket-keeper? After Dave Hurren adopted the gloves in the late 1990's Kev hit the runs big style. After he recovered, his batting hit a new peak, and managed to make the number four position his own. During 1999 he developed an interesting and unusual "shufty" defensive style, where his feet movements fooled the bowlers into a false sense of security. His eye was good enough to be able to whack the bat into place just in time, and frustrate the fielding side almost to distraction at times. This style served him extremely well during that year's President's Day game. He scored a battling 93 in a total of 174 and ended the year by winning the Improver's Award at the annual Awards Dinner. "Trevor" is not really a midget. 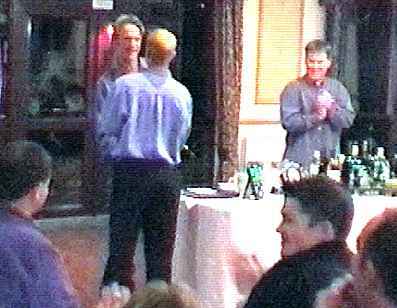 However, you can see the photo of him receiving his award (here). If you look closely it's entirely possible that Tim is allegedly saying to Trev (who was right in front of him at this point) "Stand up, Kev. Oh, you are." Trev's bird-pulling dexterity was further enhanced on tour in 2000. If you're reading this, Trev, make me an offer I can't refuse (although I'll try) and I WON'T post a picture.... Being short (no, not short, more "less tall" - Ed) is no bad thing when staggering home from the Hare & Hounds. It's not too far to the ground which thankfully is always there to break your fall. And your nose.